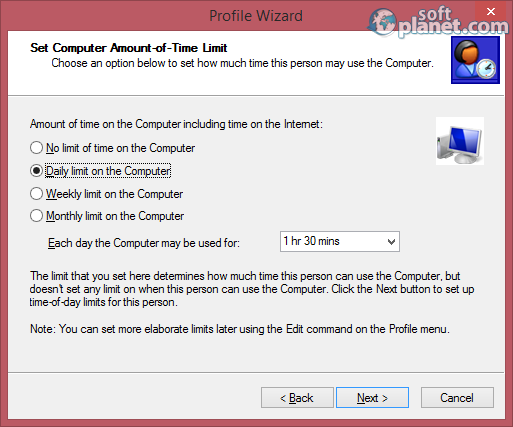 SoftPlanet makes it possible for everyone to get free ComputerTime download directly from our servers. There is no registration needed for downloading. Computers are not what they used to be a few decades ago. Now they are much cheaper, much faster and widely spread. Chances are you have at least one computer at home and while it will allow you to do a whole lot of things, having a computer may turn into a problem if you have small children as they are likely to spend a lot of time on it, thus ruining school performance and quite possibly their health too. It is clear you need a tool that can manage computer usage. We are happy to present ComputerTime 4.1.0.311 to you – a software program that can take care of this issue quickly and problem-free. We were really impressed by ComputerTime and all the features that this application comes with. It arrives to you with a simple installation process, which means you can get it going in just a few short minutes. But there's more to it – it has a built-in program wizard that will take good care of you asking you questions how you want to limit computer and Internet usage. Add a simple but useful interface and you will see that you are in good hands. 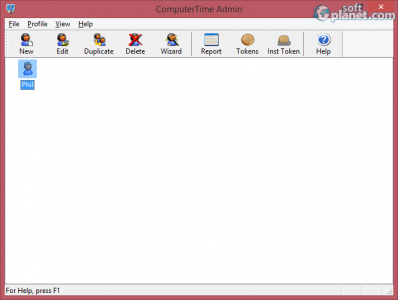 In a few words ComputerTime is a simple and powerful app that will do a great job for you. In a way we can say that ComputerTime has two interfaces. This is because the application comes with a built-in configuration wizard that you will be working with for the most time. It resembles a questionnaire where you make choices and enter time spans. Once you are done with this wizard you can see the “actual” program interface. It is actually rather simple – you will get a small program window with a toolbar on top that has a number of icons and an empty space right underneath where all profiles that have been created so far are listed. 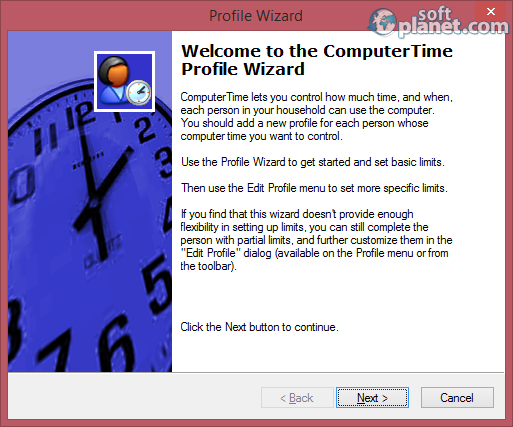 ComputerTime is extremely easy to use. Once you run this tool you will have to work with the integrated program wizard that will ask you a number of questions on when and how long Internet and computer usage will be limited. This is also the place where you can create user profiles. This is where the real program interaction takes place because once done you will see the profiles that you created in the program interface – from now on it only comes to managing them. In a few words using ComputerTime is a pleasure. Once you setup the program you will have to reboot your PC though. Limiting computer usage for children has never been easier thanks to a tool called ComputerTime. We can only say good words about this utility – it is easy to install, easy to use and offers unmatched flexibility. You will have to pay for this software program because all these nice features cannot come for free but you should know that your money will be well spent. Until then you can use the trial version for 14 days for free. Our security scan shows that ComputerTime is clean from viruses. The current version of ComputerTime has been scanned by our system, which contains 46 different anti-virus algorithms. That ensures that ComputerTime 4.1.0.311 is 100% safe for your computer.